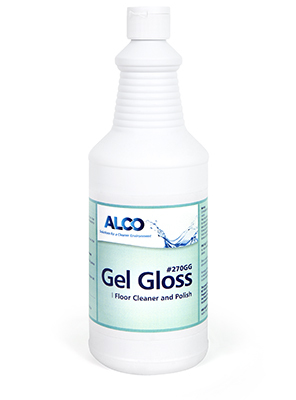 Alco Gel Gloss - Alco-Chem, Inc.
A combination of polymer, detergent and solvent to clean, shine and maintain vinyl, vinyl composition, linoleum, terrazzo, rubber, natural stone and marble floors in one labor saving step. This viscous gel removes dirt, imparts beautiful gloss and leaves a thin protective coating behind. Can be applied without interruption in high traffic areas. Removes dirt from finished floors and maintains appearance. Produces an amazing shine on finished floors. Thick gel is easy to apply to floor and reduces splashing. Economically priced - no waste Works with single or dual pad systems to clean and polish without traffic interruption. Deep cleans and shines unfinished floors such as studded rubber and marble. Large Area Coverage – Up to 50,000 Sq. Ft. Per Quart. This product meets ASTM D2047 method for slip resistance.